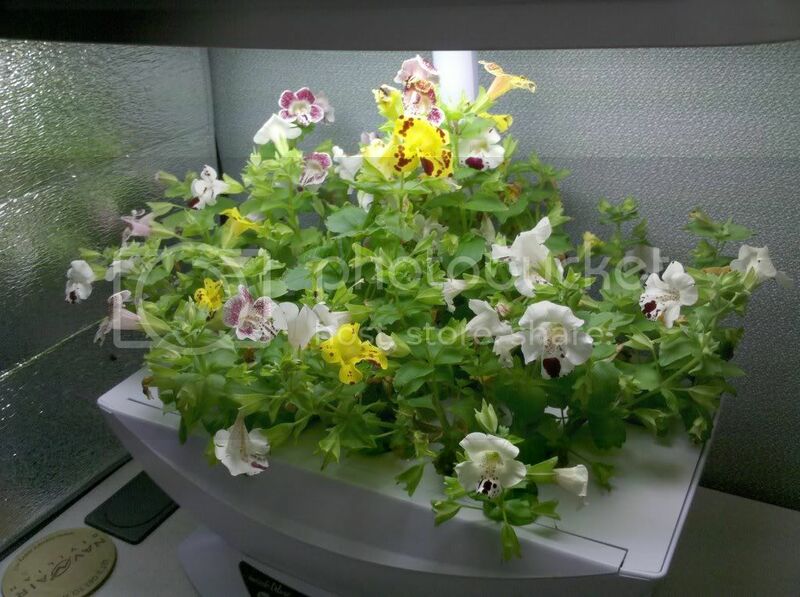 AerogardenMastery | Page 56 | Taking your Aerogarden beyond. I have recently separated my peppers out of the aero unit and into their own DWC buckets. The tomatoes would have eventually taken over all of their light and nutrients had I left them all in there. There is also some romaine lettuce seedlings in DWC in the grow tent as well. Anybody else playing Farmville on Facebook? I could use neighbors, and I'd be really, really good at sending you free gifts! Drop me a line. Just got an email from Aerogrow. They don't call it that, but they're selling GrowBoxes now. Of course, they're a tad cheaper from agardenpatch.com ... come in 2 colors there, too. Monkey Flowers (Mimulus) in the work AG. Gisette shared some seeds. Very nice quick flowering plants! Roots in the water supply! Read more about Roots in the water supply! I am documenting my mom's garden that we planted together today. I'm feeling the urge to grow lettuce, more than the 7 pod system can supply. The next conversion is for a 'raft' system, this comprises styrofoam (or similar) which floats on the surface of the water in a rubbermaid type container. In the foam you drill several holes and place net pots into them, probably 2". In the net pots go rockwool with lettuce seeds/herbs in, backfill with hydroton grow rocks for stability. Nutrients, as usual, will be the General Hydroponics Flora 3-part range. Firstly apologies for the lack of posts over the past couple of months. Got side tracked by my wedding and honeymoon. However even though the plants have been woefully neglected I can at least say I have found a reasonably inexpensive holiday watering solution.